Rarely seen, the Parisian scene during the rise of the Post-Revolution French middle class comes alive in Observations sur les Modes et les Usages de Paris, aka Le Bon Genre. Originally published in 1817 with enlarged editions following in 1822 and 1827, only one copy of this title in any 19th century edition has come to auction within the last thirty-six years, the third (1827) and only available early edition, in 1993. OCLC/KVK note only six copies of this edition in library holdings worldwide, no copies of the first edition and only two copies of the 1822 edition. 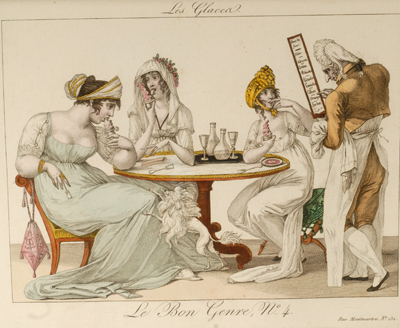 Le Bon Genre was one of the earliest series of prints to record the social trends and leisure activities of contemporary Parisians. It is the most important fashion portfolio of its time documenting, through its caricatures, the rise of modern Paris and the emerging middle-class bourgeois, its fashions, recreations and dating customs. 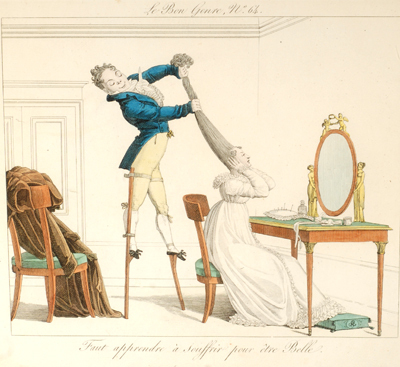 It also has fun at visitors' expense, particularly the English, whose customs and fashions the French found incomprehensible and unfashionable; the years of hostility between France and England did nothing to improve relations and the French lost few opportunities to ridicule the British. 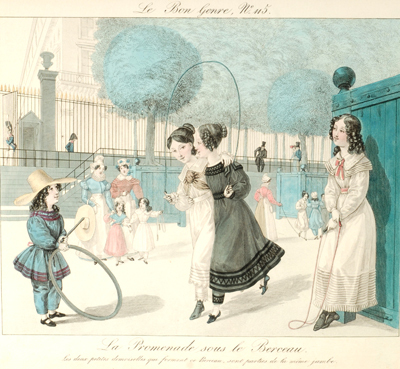 Le Bon Genre's popularity influenced most of the later fashion illustrators and journals, as well as the satirical albums typical of France, 1830-1860, and it remains an important record of French social history. It is, indeed, the key illustrated social history of Parisian life of its time, bearing witness to the colorful post-Revolution period of Parisian society as it evolved into the early Republican era. Of particular interest is the descriptive text preceding the plates that details the content of each engraving. 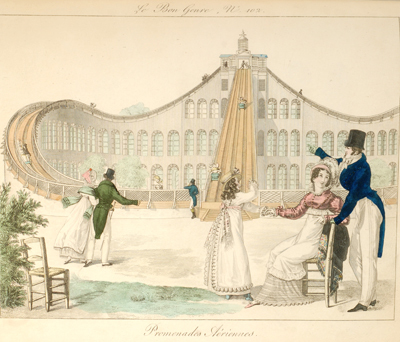 One is astonished and charmed by images of a trio enjoying a magic lantern show (#31); three women rapturously eating sorbets (#4); a trained and costumed dog act (#35); a circus balancing act (#91); a man who eats anything (#93); a huge amusement park slide (#97); and so many more enchanting engravings delicately and vividly hand-colored. 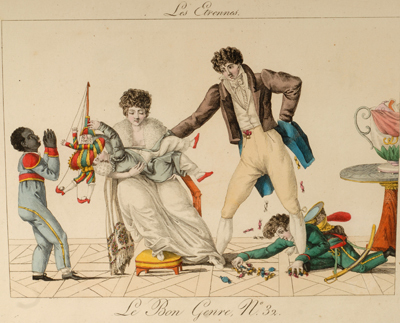 “Le Bon Genre…was first published in 1817 and went through several editions. 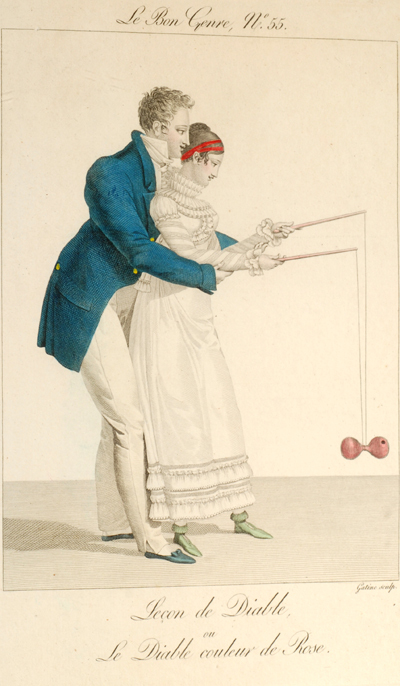 This is a record of English and French fashions since the beginning of the nineteenth century; the English fashions are more in the nature of caricatures, to show how badly Englishwomen dress as compared with the Parisiennes” (Vyvyan Holland, Hand Coloured Fashion Plates 1770 to 1899, p. 51). 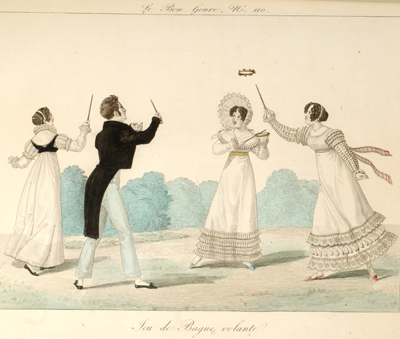 “The Bon Genre’s first edition, 104 plates, appeared in 1817. The 1822 edition included eleven additional plates; a third edition was published in 1827. 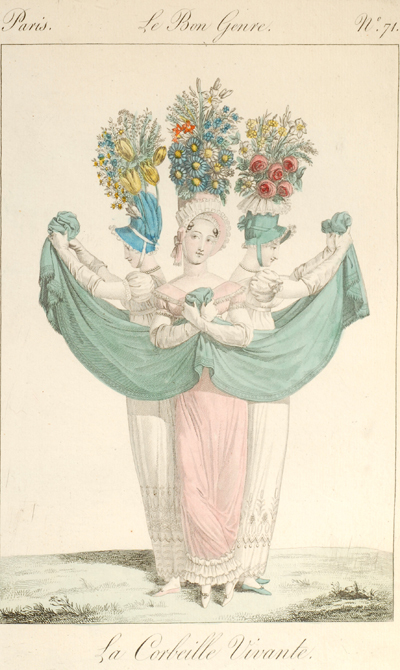 Its illustrations are lively and witty statements of the life of Paris since the beginning of XIXc., with a text of explanatory paragraphs, rather than fashion plates” (Millia Davenport, The Book of Costume, II, p. 814). 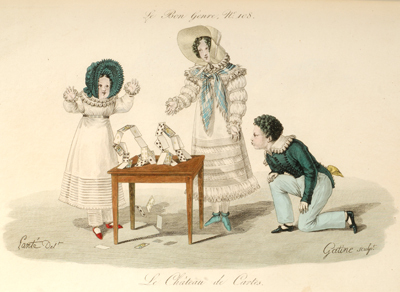 “Georges-Jacques Gatine was the leading costume engraver of his time. For many years he supplied plates for the Journal des Dames. 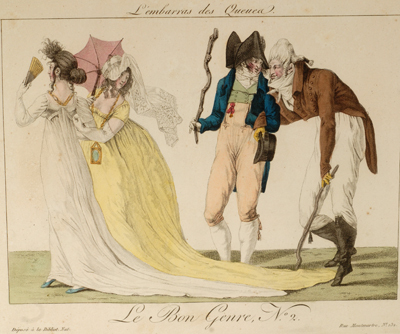 He engraved the 115 designs which make up Le Bon Genre, a lively mélange caricaturing people and scenes of contemporary interest” (Ray, The Art of the French Illustrated Book, p. 141). 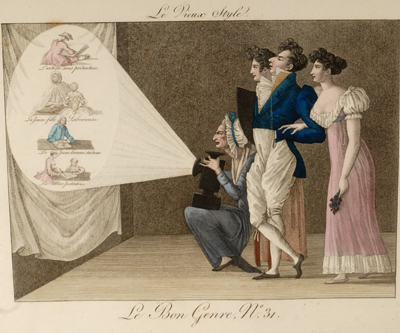 Le Bon Genre's publisher and editor, Pierre Joseph Antoine Le Bouc de Mésangère (1761-1830), better known by the name of Le Mésangère, was a fascinating character whose eclectic career covered a very wide period, from the French Revolution (1789) up to the Second Restoration (1815 -1830). First an eccleslastlc, philosopher and writer, then fashion journalist, Mésangère was, for more than thirty years, editor-in-chief of Le Journal des Dames, a periodical that had an enormous influence upon contemporary French standards of elegance and taste. Born in Anjou, 1761 to a middle-class family, Mésangère entered the order Congregation of the Brothers in 1784, and held the philosophie belles lettres Chair at the College de la Fleche. In hiding during the Terror (1793-1794), after Robesplerre's death (July 28, 1794) he began to be known as a writer for Parisian literary journals. He wrote Le Voyageur a Paris ou Tableau pittoresque et moral de cette capitale (1797) a book that gained a certain notoriety. 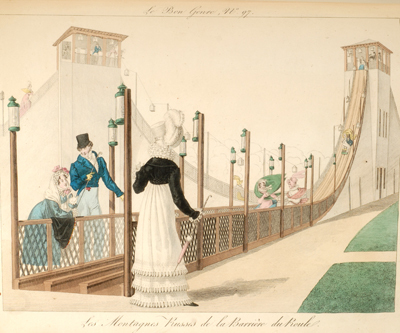 In 1799 he became editor of Le Journal des Dames, a woman's magazine founded two years earlier. It reigned supreme amongst the epoch's periodicals for ladies. With engraver Gatine executing the designs, Mésangère was the pre-eminent writer, editor, and publisher of works devoted to French women's fashion of his time. The contributing artists to Le Bon Genre included George Dutailly, François Joseph Bosio, Louis Marie Lante, Horace Vernet, and others but it is Mésangère (the editor and publisher who guided them), and Gatine (the engraver who executed their designs), who were, and remain, the stars here. [BON GENRE, LE]. 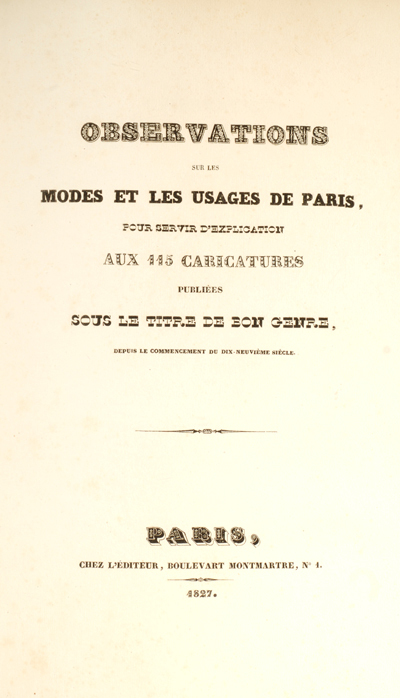 Observations sur les Modes et les Usages de Paris, pour Servir d'Explication aux 115 Caricatures Publées Sous le Titre de Bon Genre, Depuis le Commencement du Dix-Neuviéme Siècle. Paris: Chez L'Editeur [Pierre de le Mésangère], 1827. Third edition, with eleven additional plates not found in the first edition of 1817. Folio (15 1/2 x 10 5/8 in; 394 x 263 mm). , 27 pp of descriptive text, 115 hand-colored plates engraved by Georges-Jacques Gatine and printed by Vassal et Essling. Colas 2240. Vicaire I, 839-842. Rahir 332. Fascinating! Posted this on my FB page. Thanks so much. Very informative and extremely interesting. Thank you!